Writing a song is not as difficult as you think! 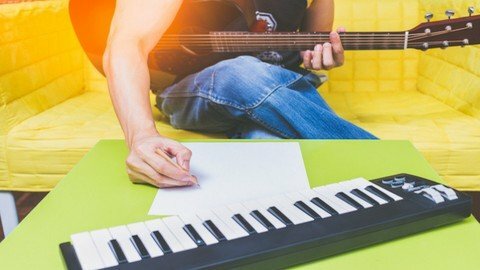 If you can play some basic chords on Piano or Guitar, this course will teach you literally everything you need to know to get you started writing songs like the pros: Practical Music theory, Chord Progressions, Melodies, Song Structure, Lyric Writing, Creativity, Songwriting Tips & Tricks, and... YOU WON'T HAVE TO READ A NOTE OF MUSIC! And if you are a beginner player, you'll learn even more about Chords and Scales throughout the course. No problem! This course will teach you basic chords on piano and guitar to get you started writing basic Chord Progressions to help you communicate your songs to other musicians you're playing or writing with. •Easy-to-read charts of Piano Chords AND Guitar Chords for all Major and Minor Keys. •Easy-to-read charts of Piano Scales AND Guitar Scales for all Major and Minor Keys. •Samples of hit Chord Progressions used in Pop, Country and Rock styles. •Insider tips that will help you write catchier melodies (hooks) in minutes. •Details on how to Transpose any song into a key that fits your vocal range.